Watching HGTV and the DIY Network, it just looks so easy to transform a home from an unpromising wreck into a seductive dreamboat—and to net big bucks along the way. Fun! Glamorous! Profitable! But here’s the off-screen reality: Flipping a home isn’t as easy as flipping channels. With tens of thousands of dollars at stake, it can be a decidedly risky business. But the bug never goes away. Although flipping activity was a key factor in inflating the housing bubble, peaking in 2005, it recovered from the crash to hit an 11-year high this year—more than 207,000 homes flipped, according to real estate information firm ATTOM Data Solutions. From established investors to budding entrepreneurs, everyone wants a piece of this action. But be warned: Real estate markets vary widely, and a successful flip requires a tricky mix of attributes. Flip in the wrong place, and that dream might turn into financial ruin. So where can an independent entrepreneur maximize profits, you ask? The realtor.com® data team put on its tool belt and set out to find the top markets for flipping and turning a profit right now. “The sweet spot for successful home flipping is finding the neighborhoods just emerging as the next hot neighborhoods in a city,” says Daren Blomquist, a senior vice president at ATTOM Data Solutions. That is, the neighborhoods should be desirable, but have older homes in need of renovation. To identify the top markets for flippers, we ranked the 200 largest metros by the share of all home sales that flip. We defined this as any type of home bought and resold within a three- to 12-month period. We included only flips that sold for more than the purchase price and excluded deals that ended in foreclosure. We left out homes bought and sold by banks and government entities. The key to successful home flipping is making sure renovation costs don’t eat up profits. So we included only markets where the average profit was at least $30,000—something that knocked would-be No. 1 Bakersfield, CA, off our ranking. The average flipping profit nationwide in 2017 was $68,100, according to ATTOM Data Solutions. But those profit figures paint a rosier picture than reality since those stats don’t factor in final renovation costs. Florida and California dominated our initial rankings. 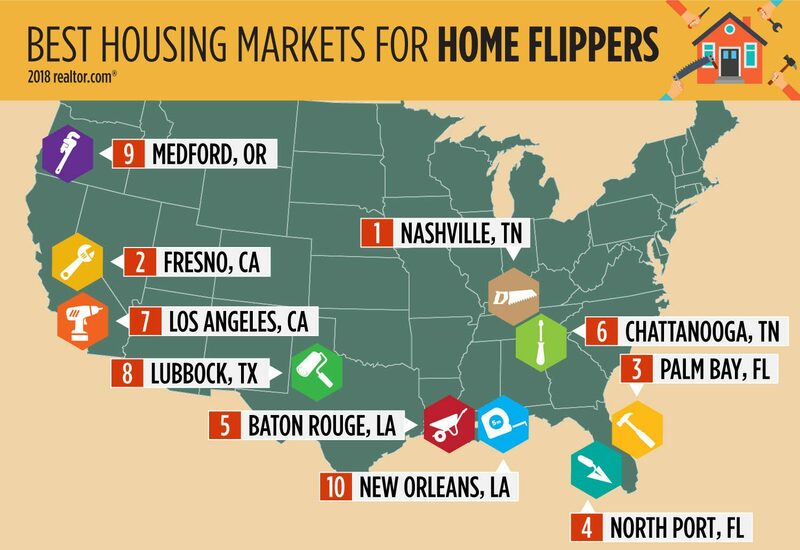 In total, these two states had five of the top 10 and 17 of the top 30 markets for flipping. To give readers a better view of where flipping has taken off around the country, we limited our ranking to two metros per state. Now let’s go to the places where home flippers make it rain. The music, charm, and good-paying jobs of Nashville are attracting folks from all across the country. That’s pushed home prices here a lot higher than in nearby Southern and Midwestern cities. You’d think that Nashville’s prolonged revival would mean that the best days for flipping are in the past—but they aren’t. But not every home buyer and seller in Music City is making a killing. In fact, some of these new flippers are getting in over their heads, pouring too much renovation work into their renovations or buying in the wrong neighborhoods, Shafer says. In recent years, savvy home entrepreneurs have started to move away from the downtown area and buy in neighborhoods such as Madison, which has bungalows and Craftsman-style homes for under $200,000. Unless you’re a wealthy real estate investor, you’re likely to get boxed out of the ultraexpensive housing markets. So the last place you’d expect to find great flipping would be in California, where the median list price is $535,000, compared with $289,900 nationally. Yet Fresno had the nation’s second-highest rate of flippers. Prices in Fresno may hardly be bargain-basement, but they’re a steal compared with ginormously expensive Golden State markets such as San Jose, which has a $1.2 million median list price for homes. And, in fact, home values here are growing substantially faster than the state’s pricier cities—an increase of 11.8% in 12 months. During that same time frame, home prices rose 7.1% in San Francisco, 5.4% in Los Angeles, and 5.1% in San Diego. After the housing bust, home prices in Palm Bay, an area on the Atlantic about three hours north of Miami, took a nosedive. Tourism is the main driver here, and for a time, those beachcombers disappeared. But that created a great climate for home flippers, who saw an opportunity to buy low and turn a profit as the market revved up again. Once the recession ended and home prices started to recover, margins for home flipping became extremely attractive in Palm Bay and across the Sunshine State. But widespread success in the flipping game is a double-edged sword, and years of fast home appreciation here have made high profits tougher to come by. Like Palm Bay, North Port got pummeled in the economic downturn. But retirees, not tourists, have been the savior of this Gulf Coast housing market an hour and a half south of Tampa Bay. That comes with its own set of challenges for flippers. In some places you can buy a home, paint it, spruce up the kitchen and bathroom, and slam dunk it back onto the market, easy-peasy. Not in the North Port metro area, which includes Sarasota. Baby boomers have notoriously particular tastes. The amenities they want include open decks, patios, an open floor plan, and private yards, according to the 2017 Del Webb Baby Boomer Survey, which is sponsored by homebuilder PulteGroup Inc.
That means homes are a little pricier here, but so are the profits. As more folks jump on the flipping bandwagon, profits go down. But in flip-happy Baton Rouge, the returns have stayed high. In fact, during the third quarter of last year, Baton Rouge had the second-highest return on flips in the country, at 122%, according to ATTOM Data Solutions. Lower home prices have helped keep the flipping action hot ‘n’ steamy. In New Orleans, just over an hour’s drive east, buyers will find a median list price of $280,100, or 18% higher than in Baton Rouge. But returns vary by neighborhood. In the 70814 ZIP code or Monticello, home prices jumped 43% in the 12-month period ending in March, to $157,000. This area is full of one-story, three-bedroom homes. Some listings in this neighborhood tout their eligibility for no-money-down mortgage loans from the United States Department of Agriculture. They include this three-bedroom, Acadian-style home for $165,000. While home flipping in some parts of the country is dominated by deep-pocketed investment firms, in Chattanooga the little guy is doing quite well. “We have individuals doing one or two flips a year to supplement their income,” says Nathan Brown, team leader and CEO of Keller Williams Greater Downtown Realty, in Chattanooga, which did 4,000 transactions in this market last year. Many of these flippers have the skills, like carpentry, to do a lot of renovations themselves, he says. In search of profits, flippers have moved on from places such as North Chattanooga and into neighborhoods like Red Bank, where a cottage or Craftsman-style home can be purchased for between $140,000 and $170,000, and flipped for more than $200,000. Wait, what? Could the City of Angels really be heaven for ambitious flippers? Believe it, although it’s not a market for the squeamish. Southern California might be home to Hollywood, but the flippers here aren’t putting on an act—they’re seriously cutthroat. The Los Angeles market is dominated by real estate investors who operate like well-oiled machines, knowing where to buy and what to renovate to milk the biggest profits. “It’s harder now, profit margins aren’t as large as they were,” says Mel Wilson, a broker and owner of Mel Wilson & Associates. After the Great Recession, investors could scoop up homes for cheap. Now, they’re competing against multiple bids. So they’ve changed up their business models. One new trick is to buy properties with bigger lots, renovating the original home and then building a second home on the lot, Wilson says. That yields more value. But some things in the flipping business haven’t changed. Oh, and let’s not forget that the hit HGTV show “Flip or Flop” started in the L.A. market in 2013, disseminating the dream to a national audience. 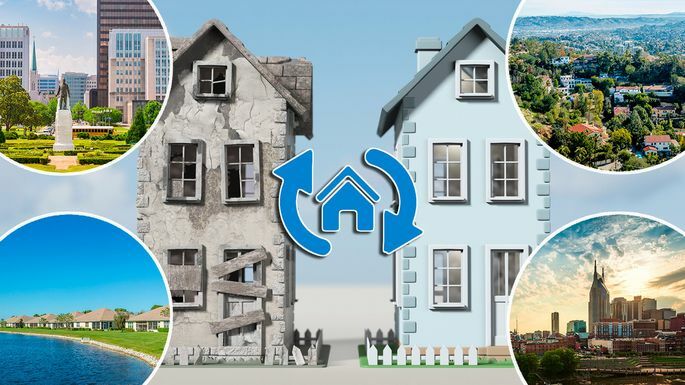 “There are a lot of homes that need minimal repairs and upgrades, which is ideal for flipping, something you want to do on a $20,000 to $30,000 budget,” says Glenn Hill, an architecture professor at Texas Tech in Lubbock. In the Melonie Park neighborhood, buyers will find lots of three-bedroom homes built in the 1960s that need some work. It’s an area with the good schools and feeling of community that buyers are seeking. Located just north of the California border, Medford is full of Oregon’s prime scenic beauty and draws in retirees and outdoorsy folks. Unlike high-powered West Coast cities such as Seattle and San Francisco, the economy here is a little tamer, and that means flippers are geared toward a different group of buyers. Neighborhoods such as the West Medford area are where flipping is most prevalent. Here, flippers can find homes priced around $150,000, but in need of plenty of TLC. In 2005 Hurricane Katrina hit New Orleans, damaging or destroying more than 800,000 homes. That disaster forced mass foreclosures and a glut of homes in unlivable conditions—which also created opportunities for home flippers willing to roll the dice on the Big Easy revival. Slowly but surely the housing market has rebounded. Yet the market still has a surplus of vacant and run-down homes that keep the options for home flippers strong. But buyers need to prepare for substantial overhauls if they buy homes that have experienced flooding—there’s a good likelihood that everything from electrical outlets to cabinets to Sheetrock will need work or even outright replacement. Fortunately, there’s plenty of support to be found in the flipping game, including groups such as Buy, renovate, flip New Orleans houses for fun & profit on Meetup.com. They have barbecue networking events, where flippers coach one another on how to be successful in the New Orleans market. Creole barbecue?! What’s not to love?